Rene Lalique Opalescent Vase "Malines"
René Lalique Opalescent Vase "Gui"
René Lalique Opalescent Vase "Graines"
René Lalique Opalescent Vase "Perruches"
René Lalique (1860-1945). Opalescent decorated all-over with a design of pairs of small birds perched amongst foliage. Model created in 1919. highlighted with blue stain H 25.5 cm "Perruches" an ovoid shaped vase in amber tinted blown-molded glass. Signed "Lalique". Measures: H 26 cm Bibliographie: Felix Marcilhac, "Rene´ Lalique 1860-1945," les Editions de l'Amateur, Paris, René Lalique’s Perruches Vases Fly High:. VASE HAVING BEEN DRILLED ORIGINALLY FOR ELECTRICITY AND RESEALED UNDER THE BASE . The career of the famed jewelry designer, glassmaker and decorative artist René Lalique spanned decades and artistic styles. Best known today for his works in glass, Lalique first won recognition for his jewelry. He was described as the inventor of modern jewelry by the French artist and designer Émile Gallé, and his luxurious naturalistic designs helped define the Art Nouveau movement. Later as a glassmaker in the 1920s and ‘30s, Lalique designed vases, clocks, chandeliers and even car hood ornaments that were the essence of Art Deco chic. Even now, the name Lalique continues to be a byword for a graceful, gracious and distinctively French brand of sophistication. Born in 1860 in the Marne region of France, Lalique began his career as a jewelry designer in the last decades of the 19th century. His work employed now-classic Art Nouveau themes and motifs: flowing, organic lines; forms based on animals, insects and flowers — all rendered in luxurious materials such as ivory, enamel, gold and semi-precious stones. By 1905, Lalique had begun creating works in glass, and his style began to shift to a cleaner, sharper, smoother, more modern approach suited to his new medium. His Paris shop’s proximity to perfumer François Coty’s led him to experiment with beautiful perfume bottles. He offered the first customized scent bottles, transforming the perfume industry. By the end of the First World War, the artist had fully embraced Art Deco modernity, devoting himself to new industrial techniques of glass production and designs that manifest the sweeping lines and the forms suggestive of speed and movement characteristic of the style. Lalique’s work looked both backward and forward in time: embracing ancient mythological themes even as it celebrated modern progress. Late in his career, Lalique took on high profile luxury interior design projects in Paris, Tokyo and elsewhere. He designed decorative fixtures and lighting for the interior of the luxury liner Normandie in 1935, and decorated the salons of well-known fashion designer Madeleine Vionnet. Today, Lalique’s influence is as relevant as it was when he opened his first jewelry shop in 1890. In a modern or even a traditional décor, as you will see from the objects offered on these pages, the work of René Lalique provides the stamp of savoir-faire. 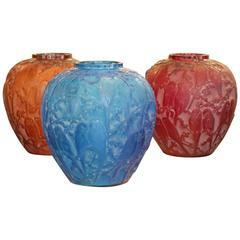 Rene Lalique opalescent glass ‘Saint Francois’ vase. Engraved makers mark, ‘R. Lalique. René Lalique opalescent glass 'Rampillion' Vase. Blue stained details. Wheel cut makers mark, 'R. LALIQUE FRANCE'. Engraved, 'N 991'. Book reference: Marcilhac 991. René Lalique opalescent glass 'Actinia' vase. Stencilled makers mark, 'R. Lalique FRANCE'. Book reference: Marcilhac 10-889. 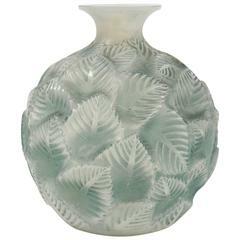 Rene Lalique cased opalescent glass 'Biskra' vase. This pattern features palm fronds. Stencilled makers mark, 'R. LALIQUE FRANCE'. Book reference: Marcilhac 1078. Glass opalescent vase model 1005 "Nivernais" by René Lalique.